Posted on 12-18-17 at 2:37 p.m.
A fountain of youth, an impressive social phenomenon, tremendous vitality-Canadians are demonstrating a remarkable desire for life! On average, Canadians report feeling seven years younger than their actual age. Note: on this indicator, we find no significant regional or linguistic variances. We measure this phenomenon in a very simple way. After asking survey respondents their age, we ask them how old they "feel" they are. Then we subtract their chronological age from the age they feel. If the result of this subtraction is a positive number, it indicates that they feel older than their actual age (which is the case for the younger people in our society); if a negative number, that they feel younger than their age. 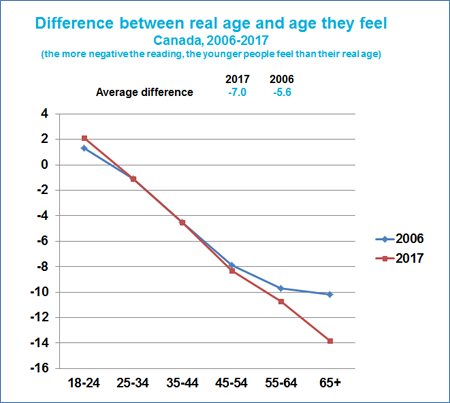 In 2017, the average was -6.96 for the entire Canadian population 18 and over, indicating that Canadians feel seven years younger than their true age, as we stated above. The older you get, the younger you feel (relatively speaking)! • And 14 years younger when they are 65 and older! What this tells us is that people are refusing to get old. They display an increasingly marked desire to maintain all their faculties despite the aging process. What's more, this feeling of vitality has been growing in recent years. When we did this exercise in the 2000s, the differences between felt and actual age were smaller. Indeed, while people feel on average seven years younger than their real age in 2017, this difference was 5.6 years younger in 2006. Our vitality is on the rise! You might be inclined to conclude that the larger difference is merely the result of population aging, which is not entirely the case (although admittedly a contributing factor). Clearly, the new generations of older individuals feel younger than their counterparts did 10 years earlier! For example, the difference between perceived age and actual age in people 65 and over in 2017 is 14 years, compared to 10 years in 2006. That's a vitality gain of four years! We are witnessing a unique societal phenomenon: a growing passion for life. The graph below is very eloquent in this regard. Usually in my posts, I use values and hot buttons to explain the phenomena I'm analyzing. In this case, I must be particularly careful and nuanced, given the strong correlation between actual age and felt age. For example, 63% of people who feel 10 years younger than their chronological age are 55 or older (compared to 38% of the population as a whole). But even so, the more people feel younger than their age, the more they display sociologically significant values and hot buttons that illustrate the sociocultural context of this vitality. The more they are "young at heart," the keener their awareness of the uncertainty and turmoil "afflicting" the world today. For example, those who feel youngest relative to their age tend to be somewhat wary of change, uncertainty and the inherent risks of our era. But despite everything, even their perception of life today as a continual maelstrom of change, they do not feel overwhelmed. Instead, they feel in control of their lives and their destiny, with enough power over their lives to thrive. Moreover, they seem to find a certain amount of stress stimulating and energizing. What has changed in the 10 years from 2006 to 2017 (the years we've been measuring this vitality) is that life had become more complex, more uncertain. The pace has accelerated. The ability to maintain control in the face of life's demands also explains why people in the lowest income brackets feel older than their age. For them, stress, particularly financial stress, is counterproductive. Among those "youngest at heart," there is also a strong sense of connection to nature, life and society, as well as to the people around them. These individuals express a strong ethical, social and ecological engagement, a willingness to do their part in our challenges times. This sense of engagement seems to nourish their vitality! A society that is aging well! This vitality is occurring in a context of remarkable progress in medicine, diet and healthy lifestyle choices, which also explains our findings. People are more aware of the prerequisites for healthy aging and are taking personal responsibility for it. All these factors seem to be coming together to produce the most enjoyable aging in the history of humanity (for most people, aging in the Middle Ages, was not a very pleasant experience!). And the social engagement of the "youngest at heart" might well prove contagious as the population continues to age. We may be in a "virtuous circle," one that could prolong this trend of growing vitality in an aging society. Let's hope that socioeconomic conditions continue to support it in the coming years. My musical clip this week is from Verdi's Falstaff, the composer's last and only comic opera. Falstaff is an old man who refuses to grow old and, to maintain his vitality, tries to seduce two women at the same time! In this excerpt, Falstaff is trying to convince his followers to deliver a love letter to each of his prospective conquests (the same letter to both women). His followers refuse, invoking the principles of honour. Falstaff entrusts his letters to a page and dismisses them. Giuseppe Verdi: Falstaff – Paul Plishka, Mirella Freni, Marilyn Horne, Barbara Bonny, Susan Graham, The Metropolitan Opera Orchestra and Chorus, James Levine (Dir. ), Franco Zeffirelli (Prod. ), New York, 1992, Deutsche Grammophon.